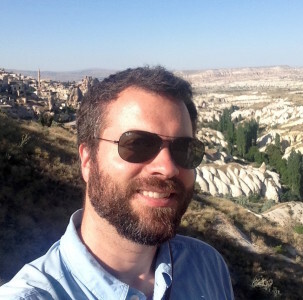 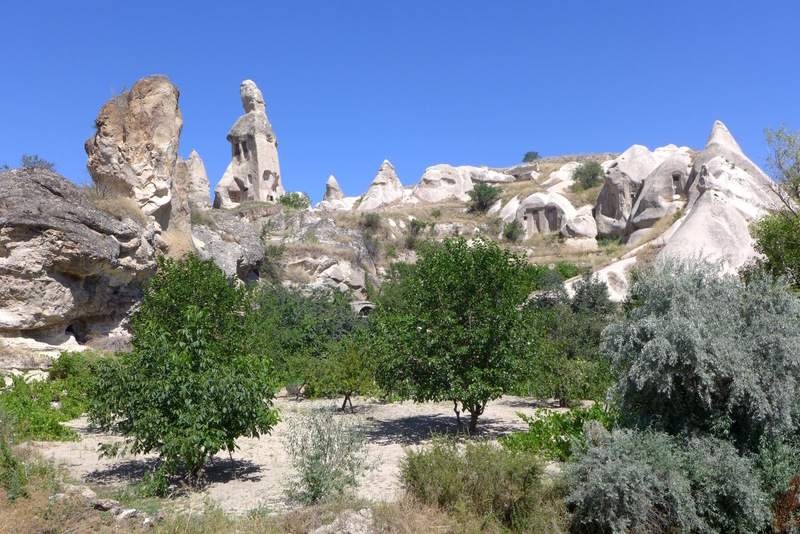 I spent three days in Cappadocia in July and had a great time. 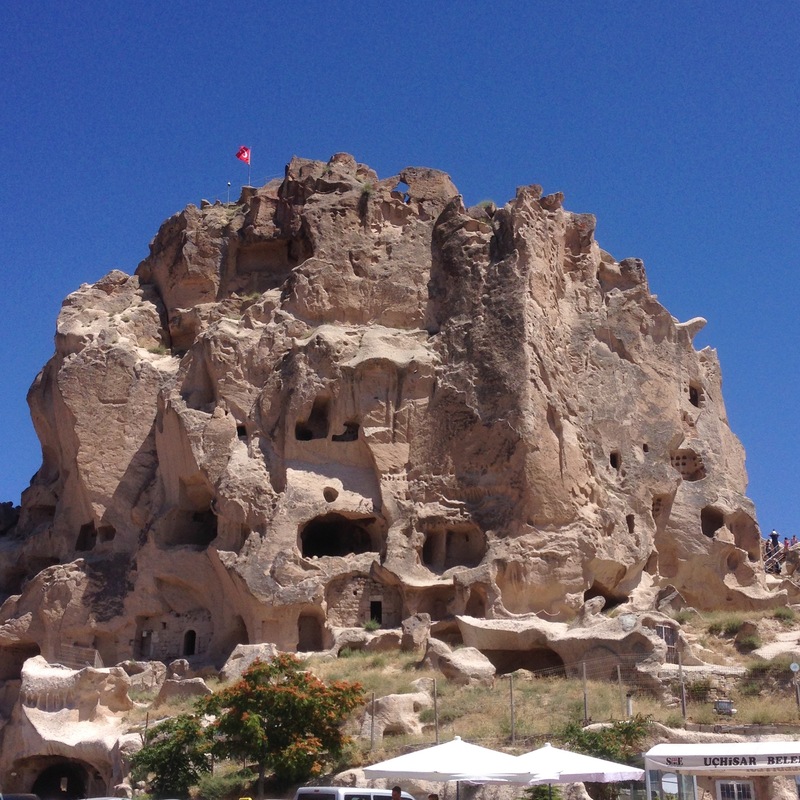 Lots to do and see, definitely worth a visit while in Turkey. 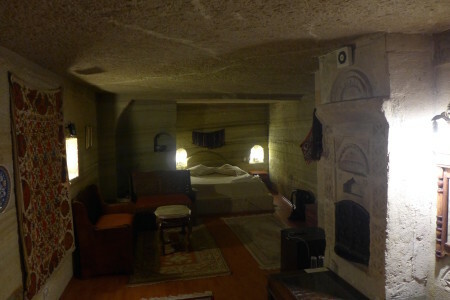 I booked a cave hotel for my stay, recommended if you can find something that aligns to your prices. 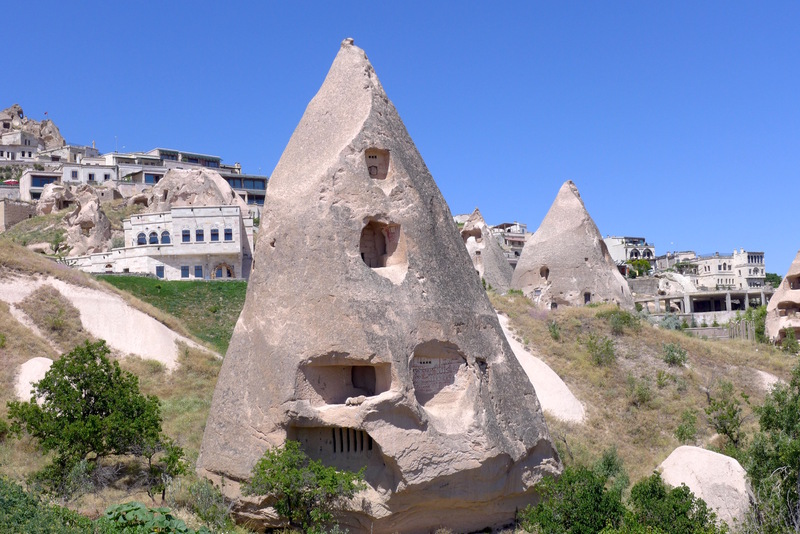 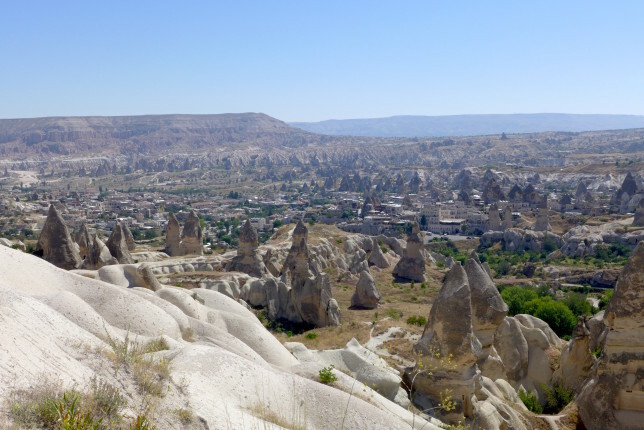 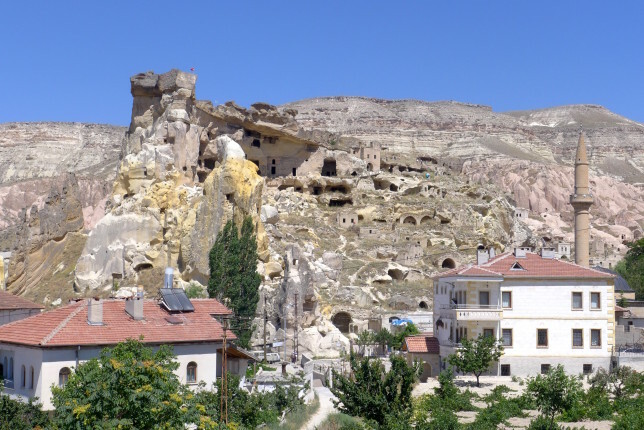 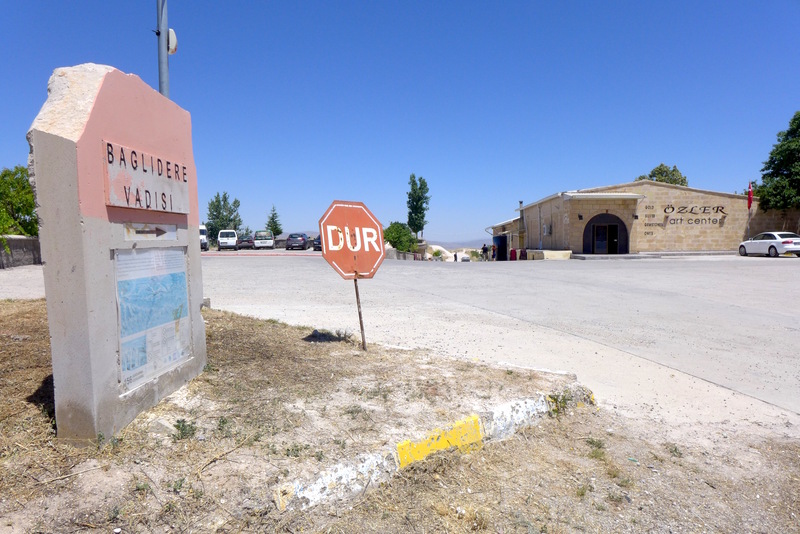 I stayed in the town of Göreme which was very convenient as there were plenty of good restaurants and I was close to the bus station, so easy to get into town. 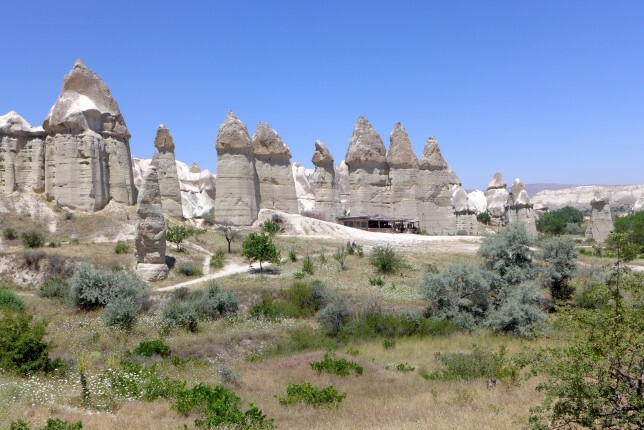 I enjoyed staying there. 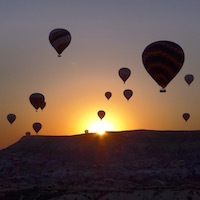 Also of note, most of the hotels there seem to have owners who are well connected with the tourism scene, so they can typically take care of booking most of what you want. 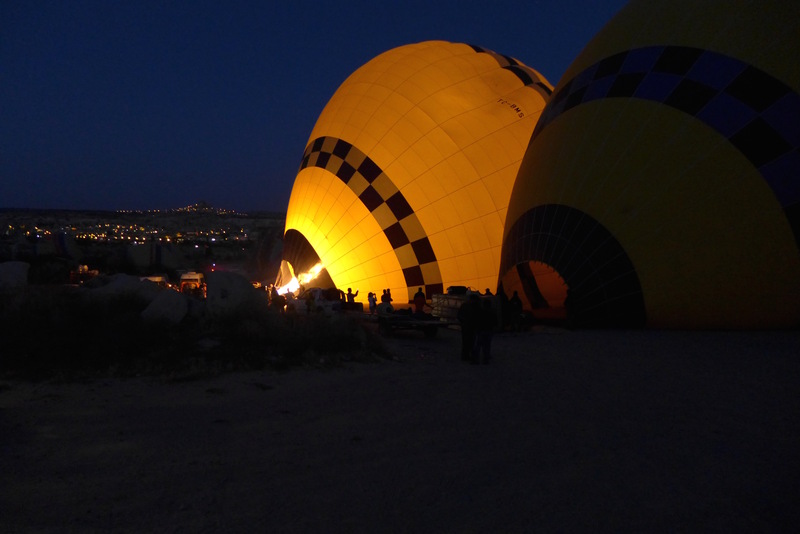 That’s what I ended up doing for both the Hot Air Balloon and the Green Tour. And by doing so, you’re also likely to have a few other guests on the trip with you, and in my case I had gotten to know some of them, so that was fun. 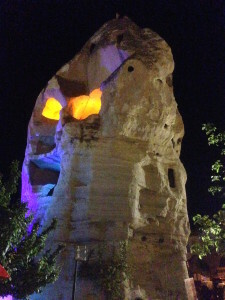 My first night I had a great hotel room. 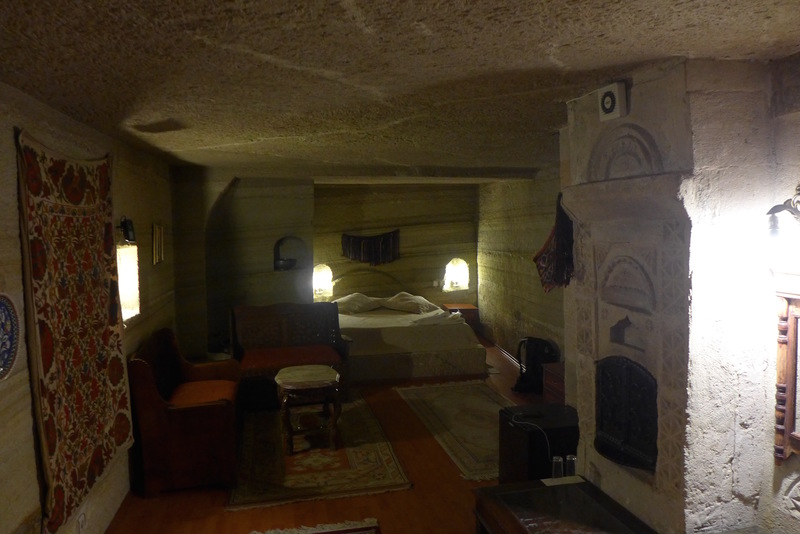 I ended up having to change room on later nights, that’s another story, but it was a nice room, particularly my room on that first night. To start my first full day in Cappadocia, I decided to go on a long day hike by myself. 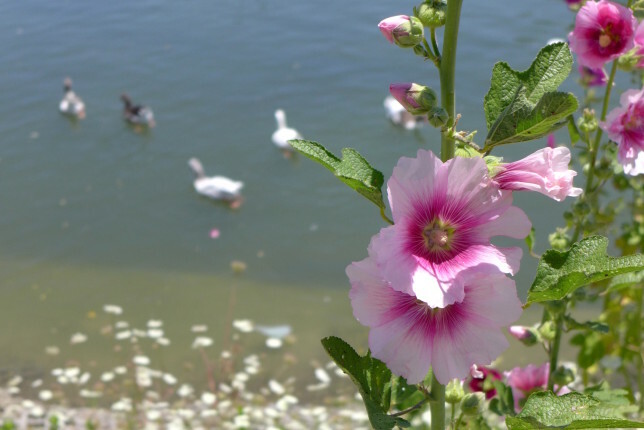 There are lots of interesting sights and hiking paths, and it’s one of the things I was most looking forward to do. 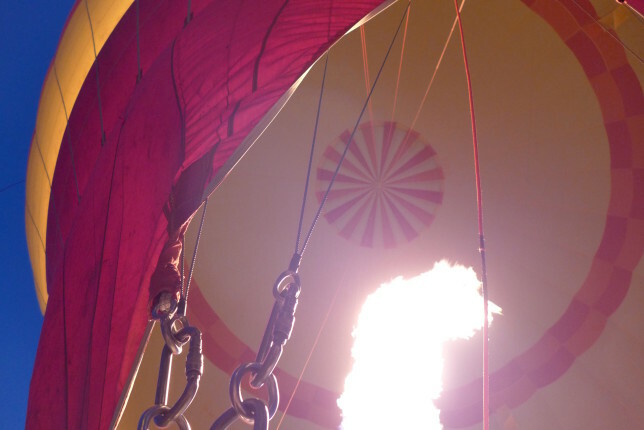 So I set out with some general ideas of how to start, and figured I’d go from there. 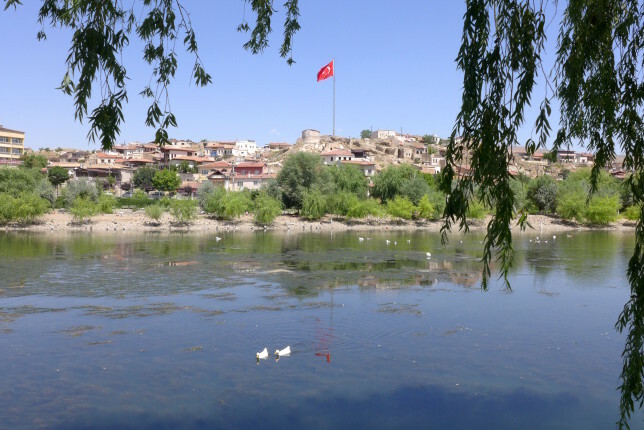 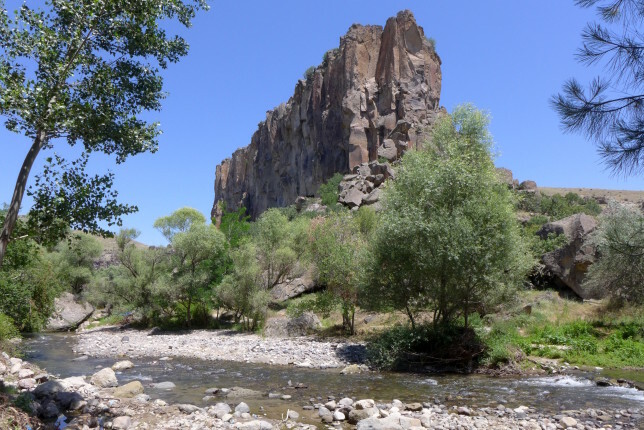 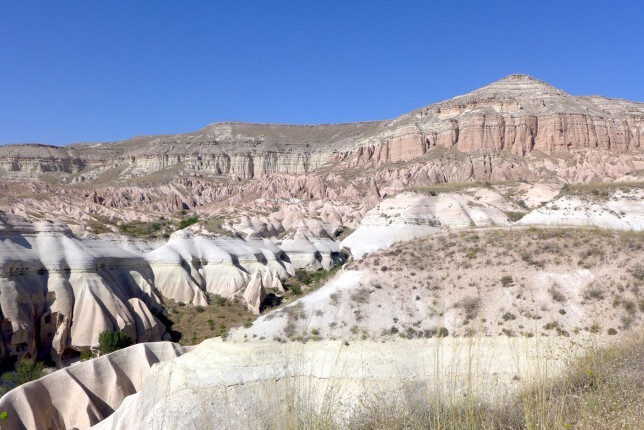 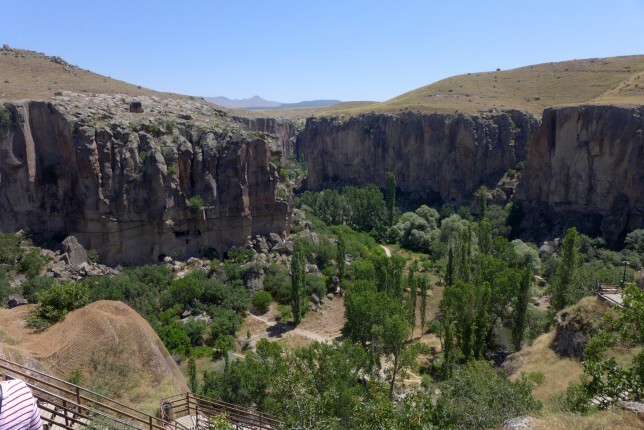 I knew I was going to hike both Pigeon Valley, which would take me to Uchisar, and then Love Valley from there. 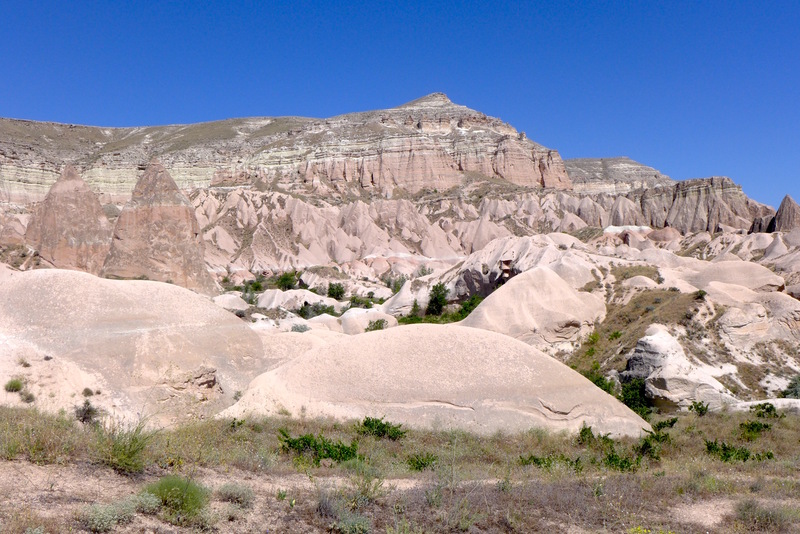 It ended up being a pretty long and intensive day of hiking, but saw lots of great stuff. 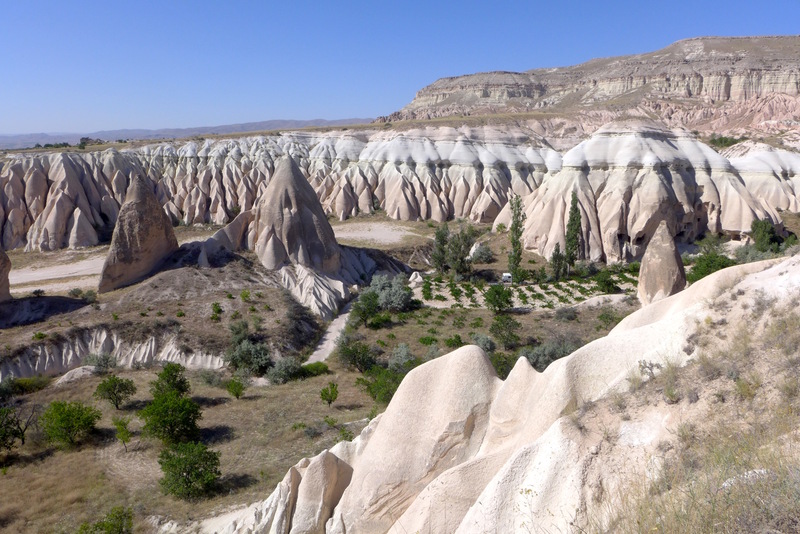 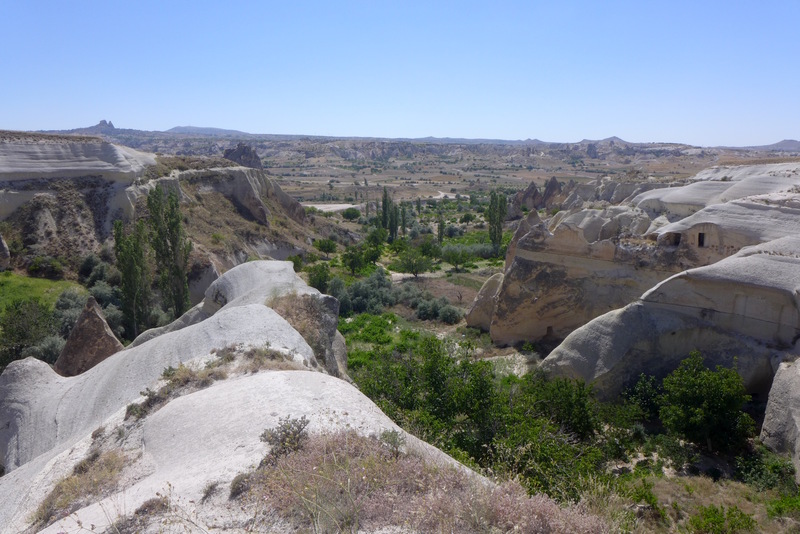 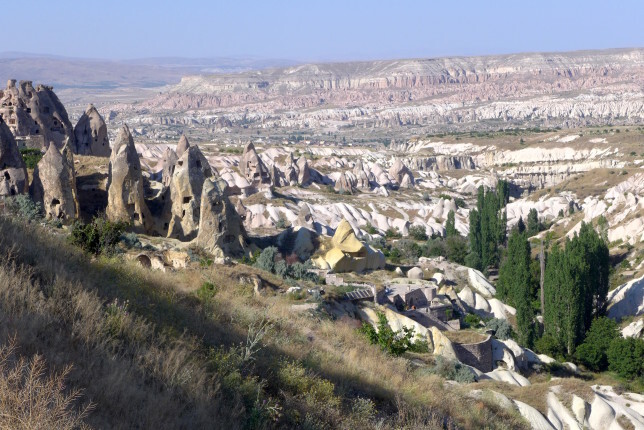 After Love Valley I headed over to Cavusin, then walked around the Rose and Red Trails for a while before heading back to Göreme. I went off trail at one point on the Rose trail, and saw some amazing sights, but it took me a while to figure out my way back down… but I made it. 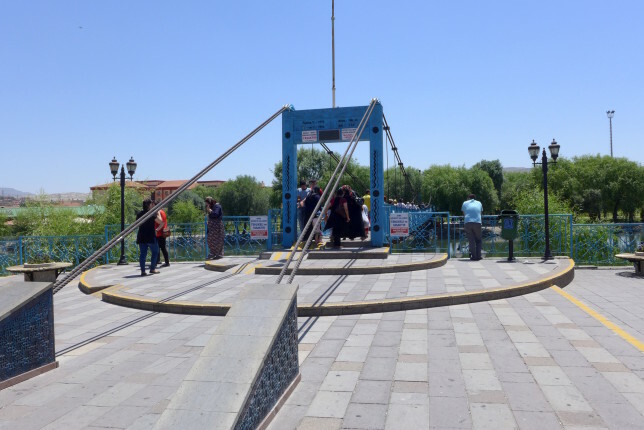 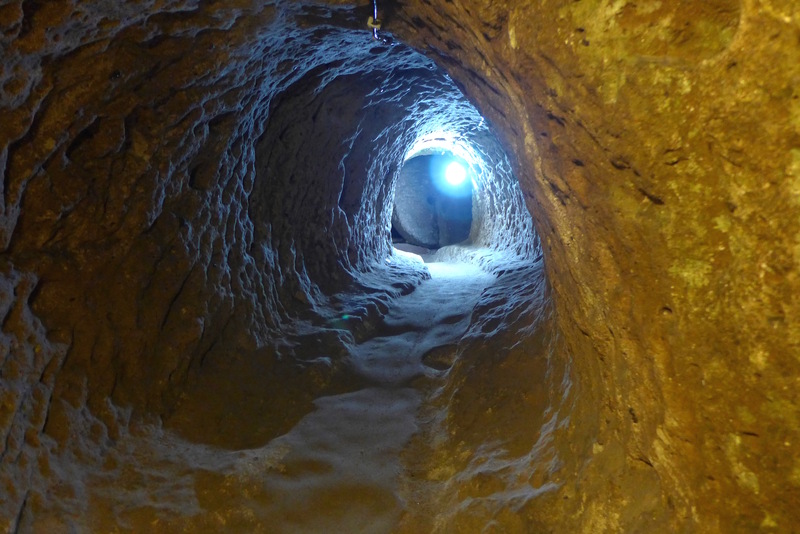 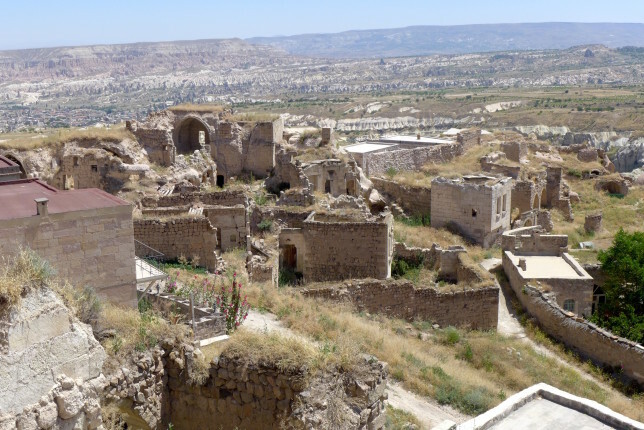 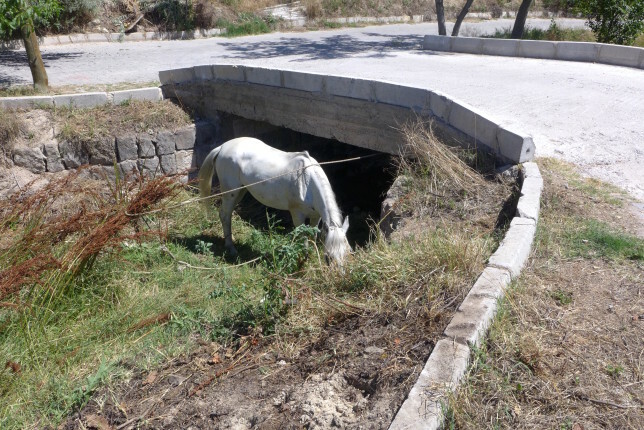 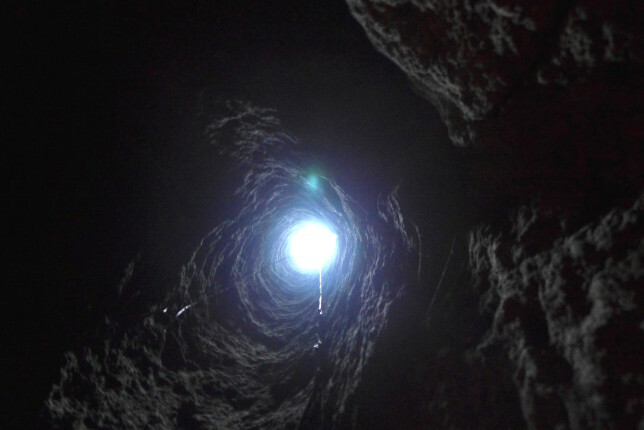 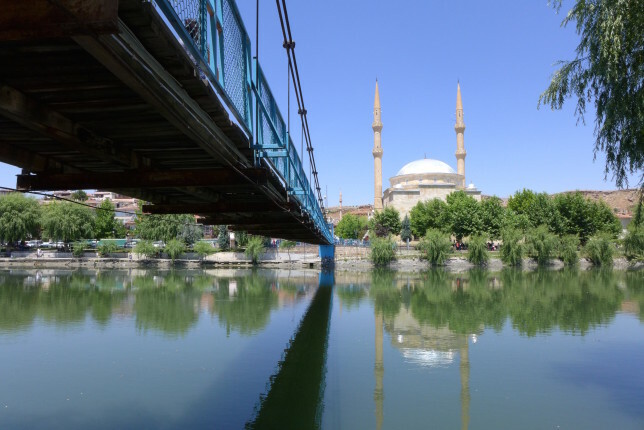 One of the things I wanted to see was the underground city of Derinkuyu. 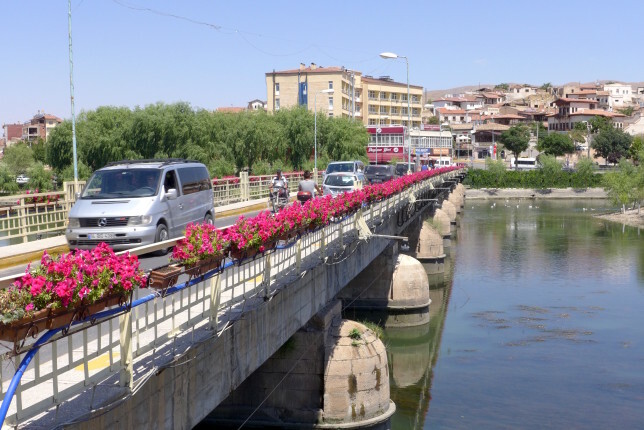 It looked like a bit of a hassle to get to by bus, and I saw that the Green Tour included it, so that morning at breakfast I asked the hotel owner about it, a very nice and helpful guy, and he got me booked for it that day. 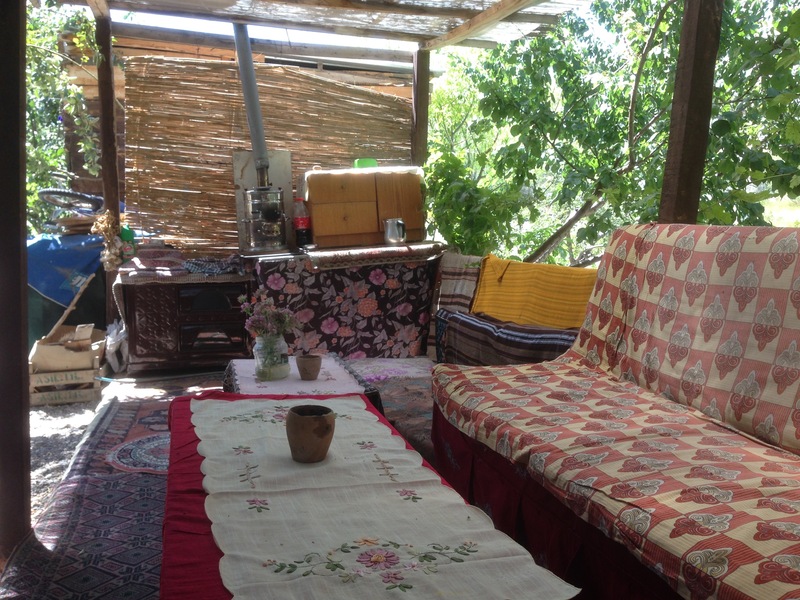 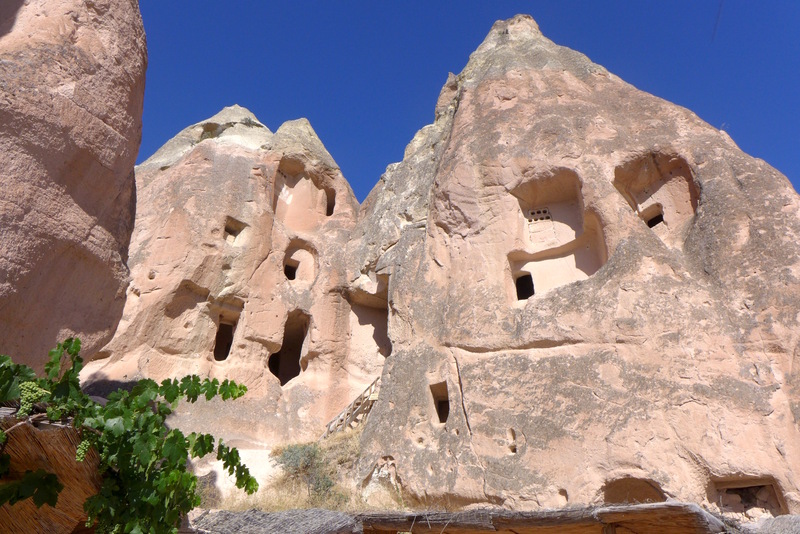 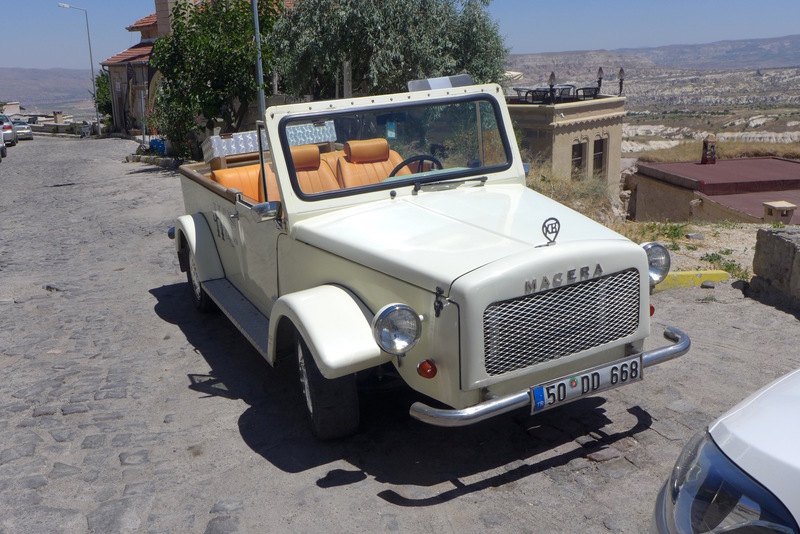 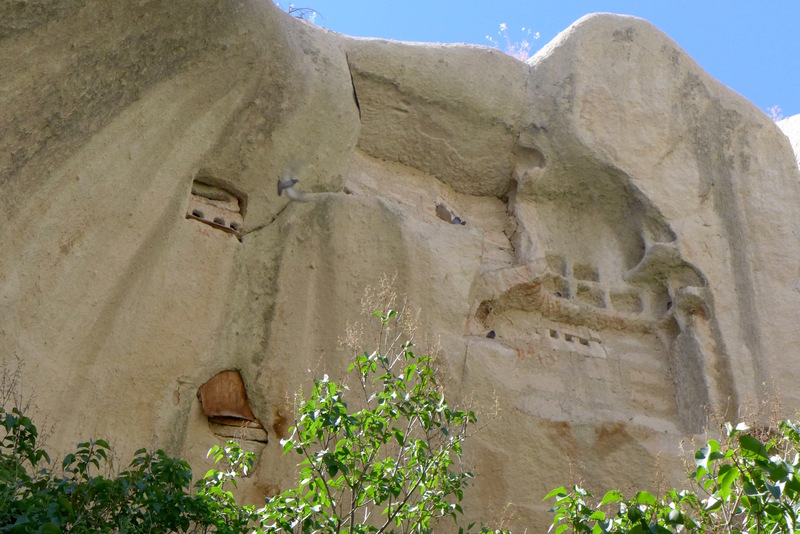 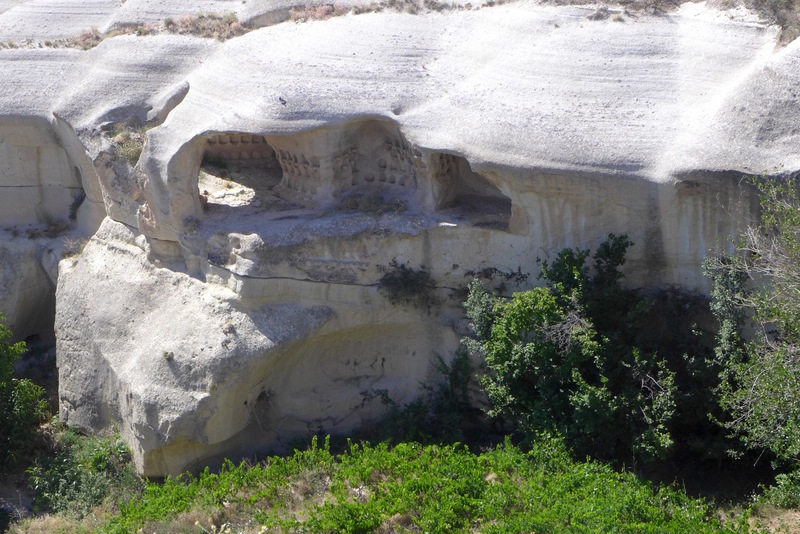 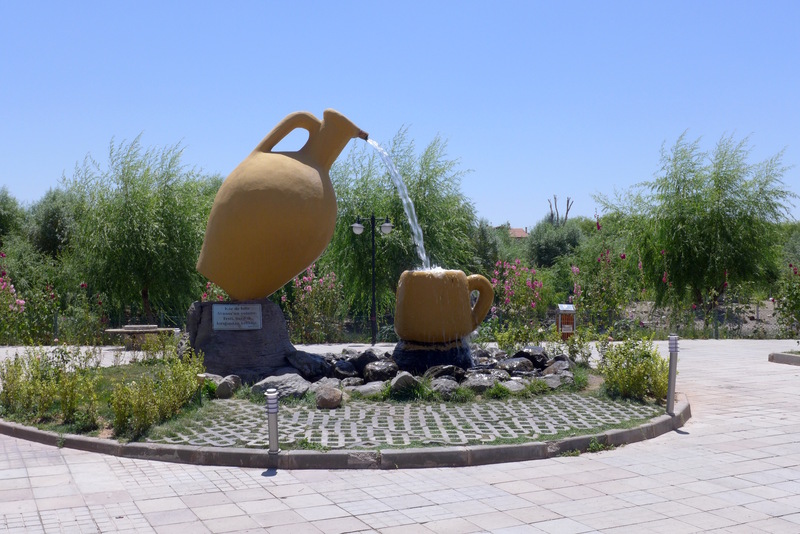 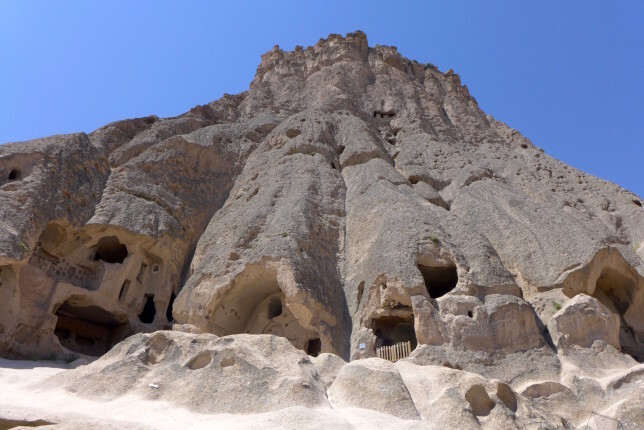 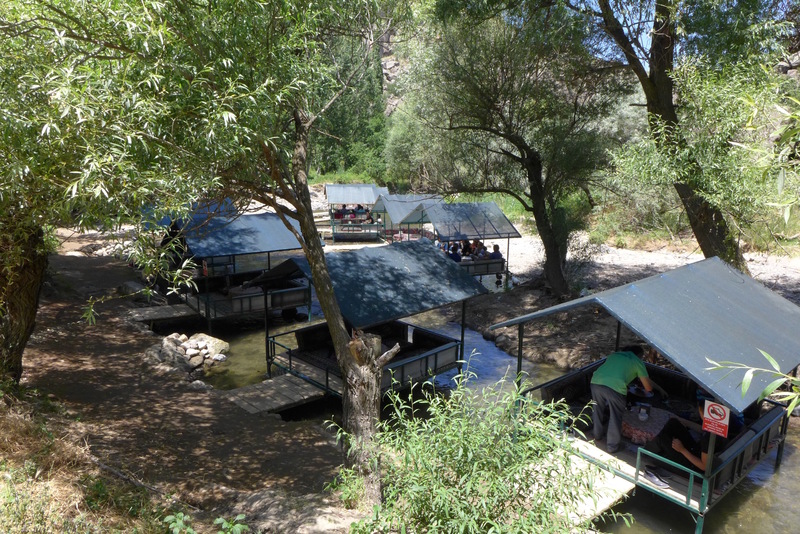 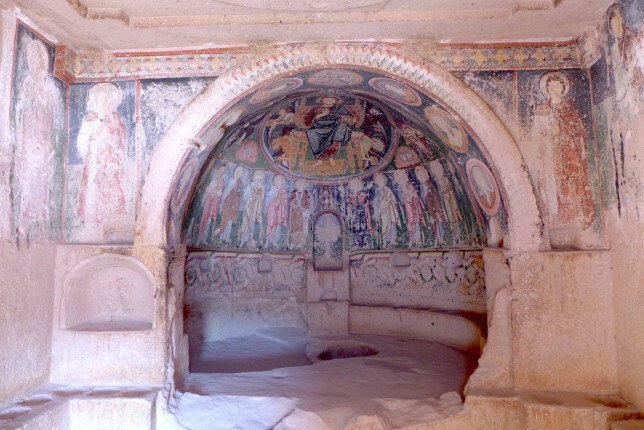 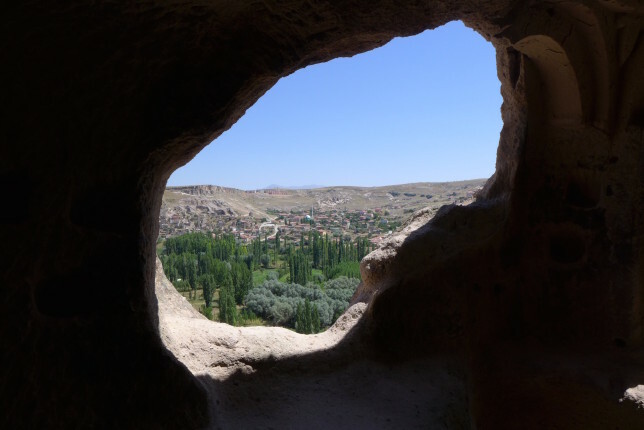 There are several standard tours in Cappadocia, that a bunch of different companies provide. So I picked this one based on the underground city and figured I’d see some other interesting things along the way, which I did. 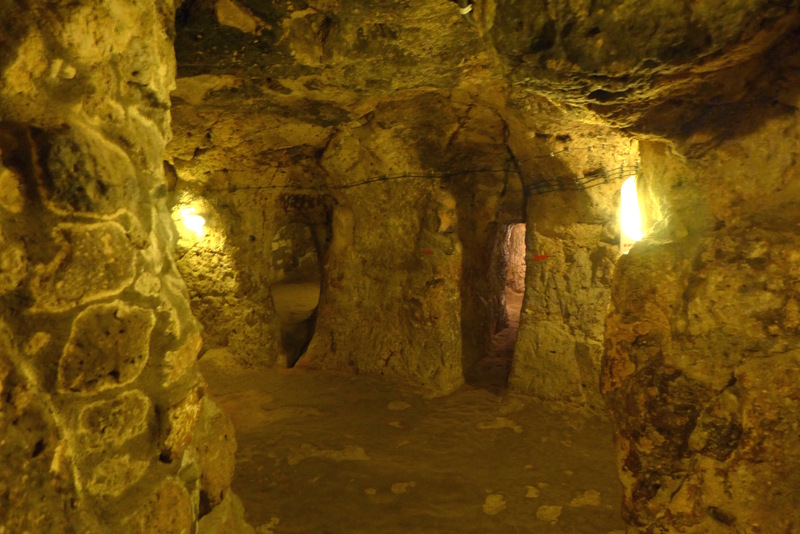 Apparently there are a couple of different orders in which to take the tour, the one I was on went the opposite direction of many of them, with our guide saying that it would make the Underground less crowded in the afternoon. I thought it worked out well. We started by going to a view point over Pigeon Valley. Then drove a ways down to the Ihlara Valley. 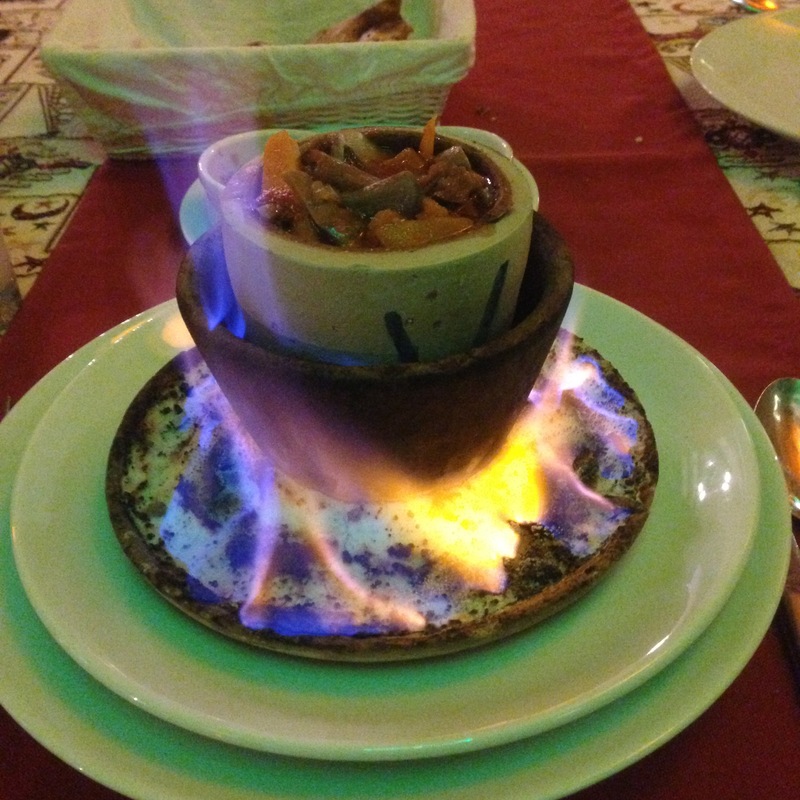 I didn’t know what to expect, but thought it was great. 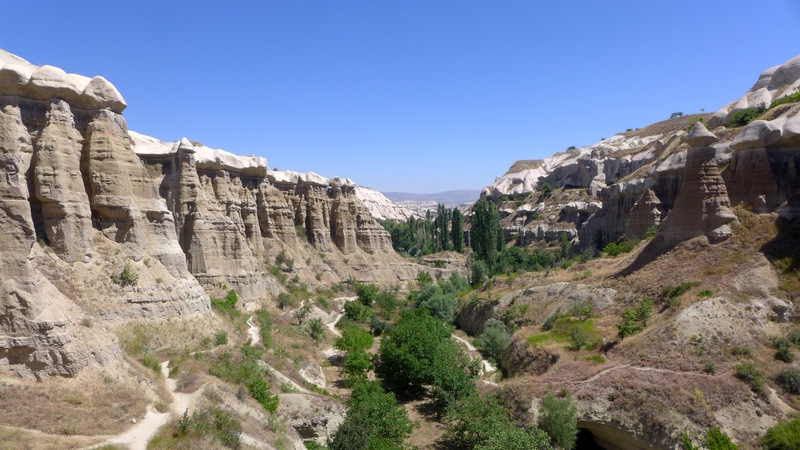 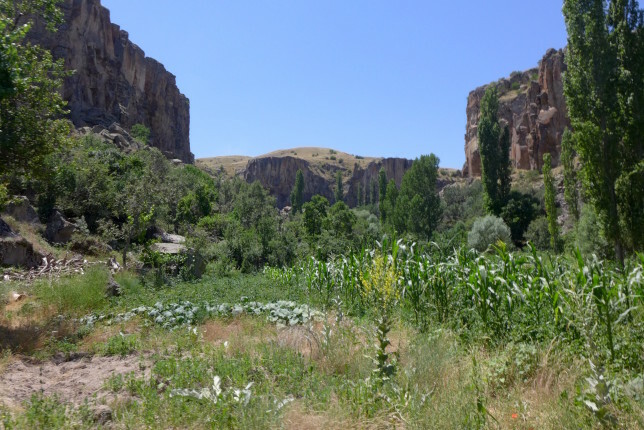 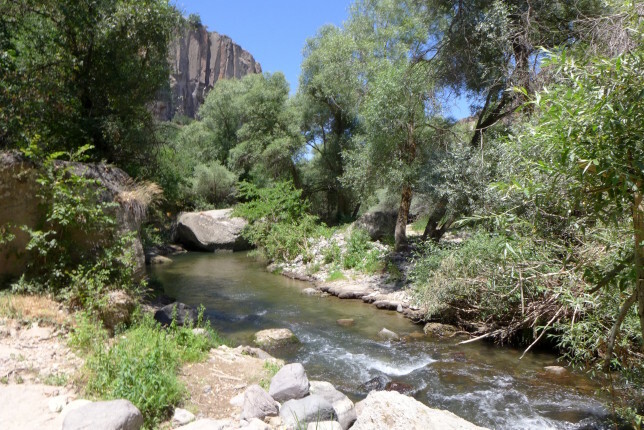 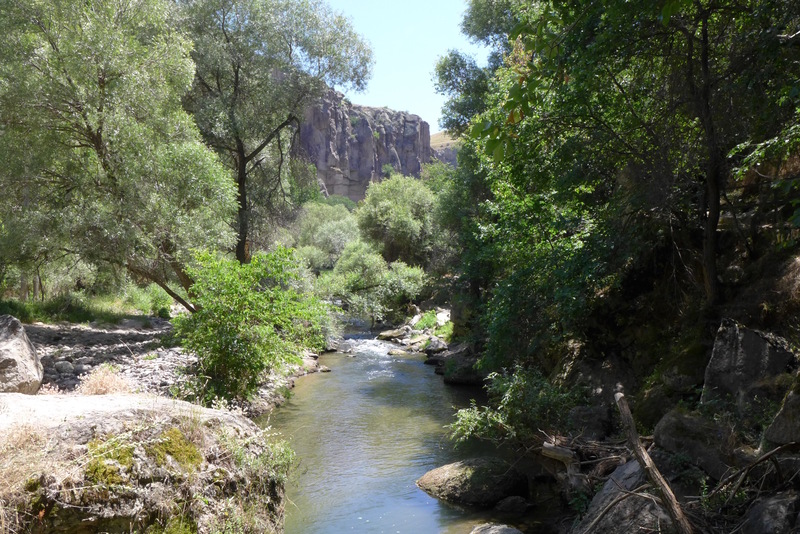 Lush and green with a nice river inside a canyon, definite change from other places I’d been in Cappadocia. 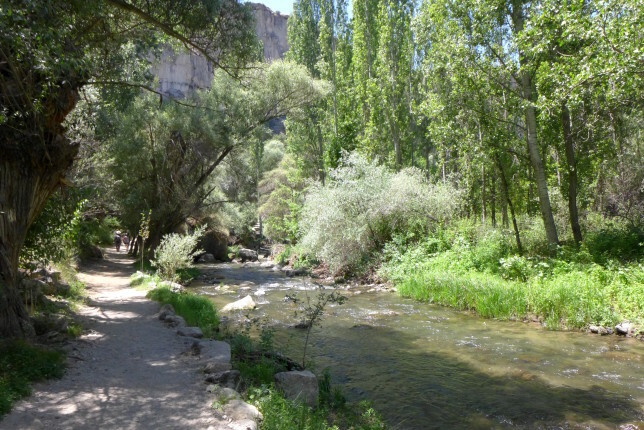 Would be a good place to just go and spend the day walking and relaxing. 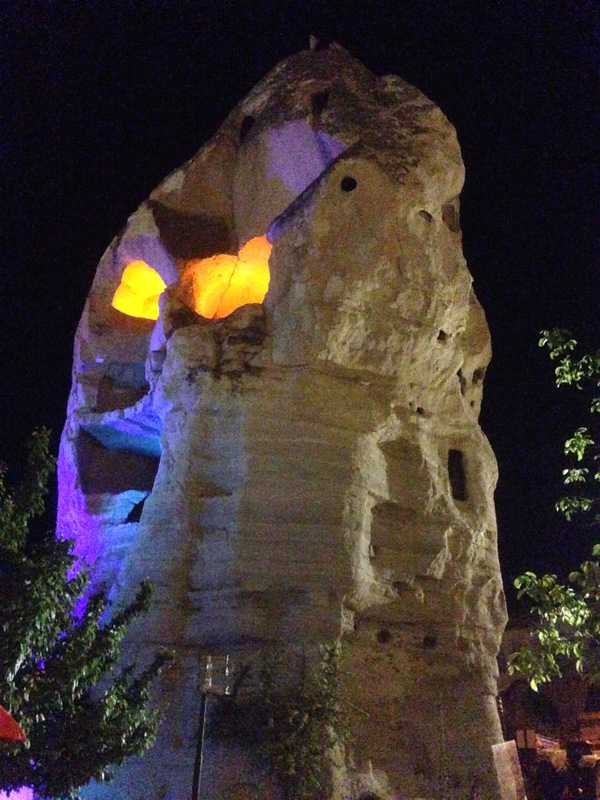 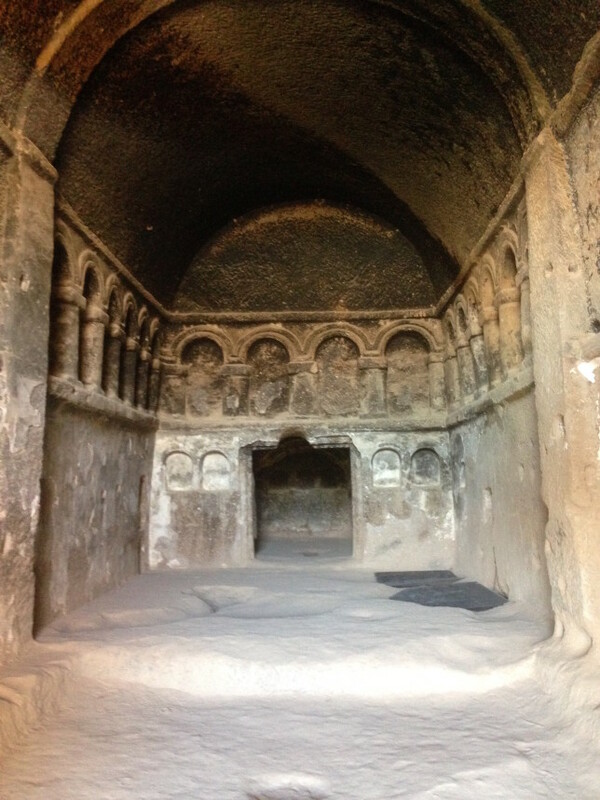 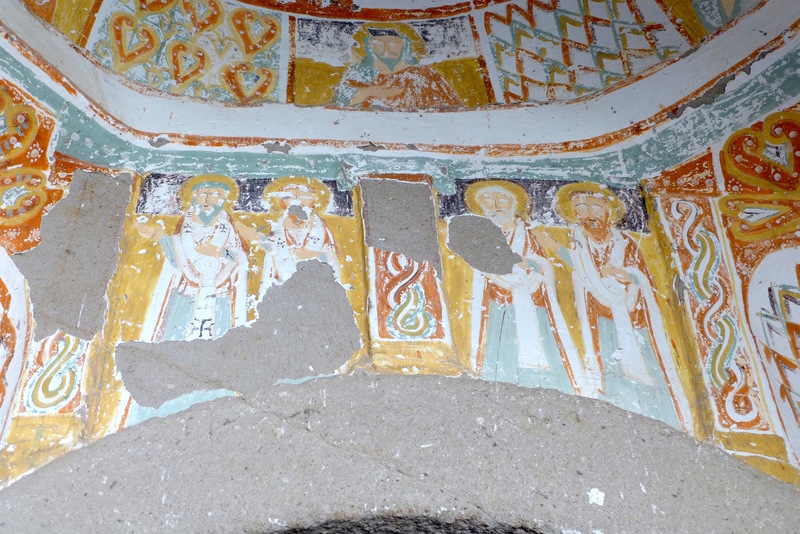 We also went to the Selime Monastery and then to the Derinkuyu underground. The underground was cool, but I think I was expecting something more and bigger. 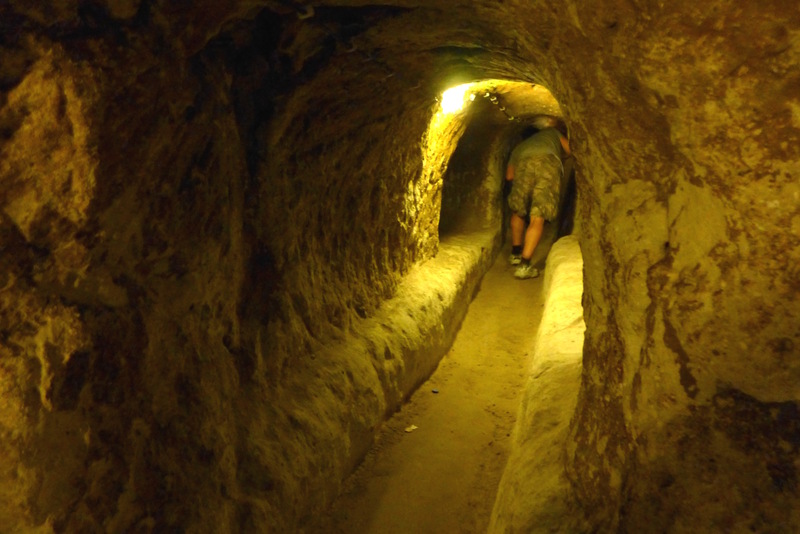 Still cool to see and hear the history from the good tour guide. 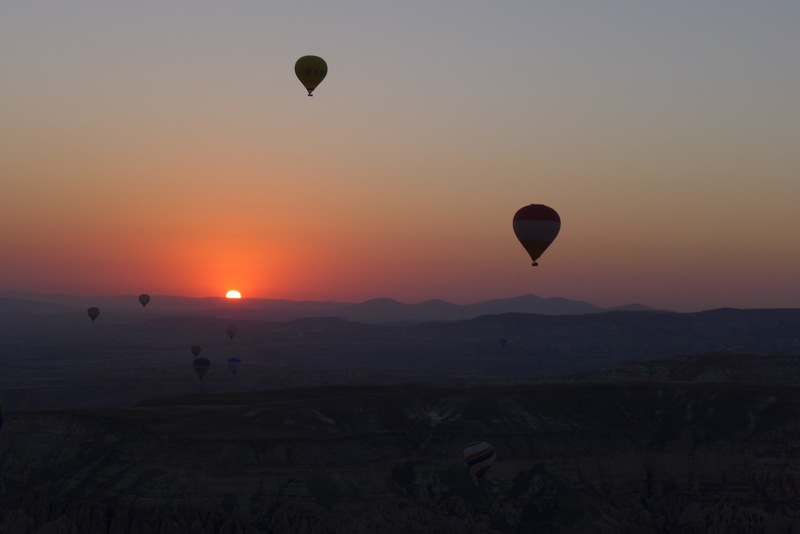 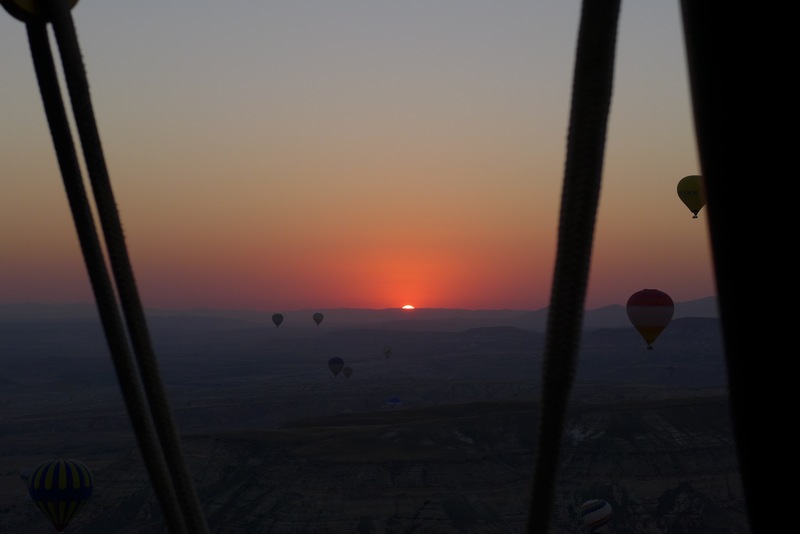 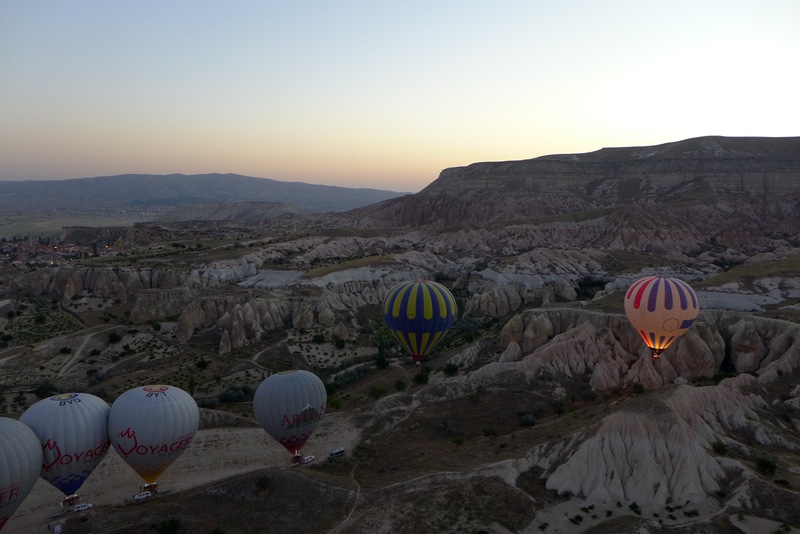 I started my last day in Cappadocia early, with a hot air balloon ride! I’d never done one before, and it seemed like if I was going to, Cappadocia was the place to do it. 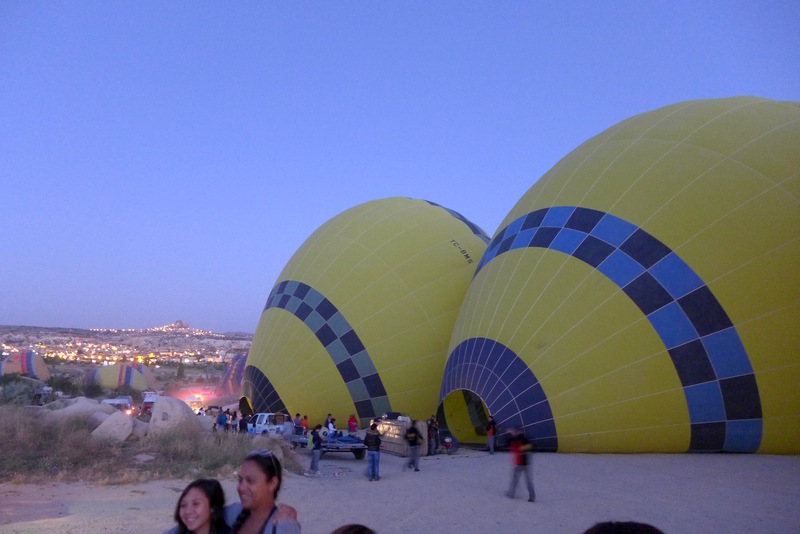 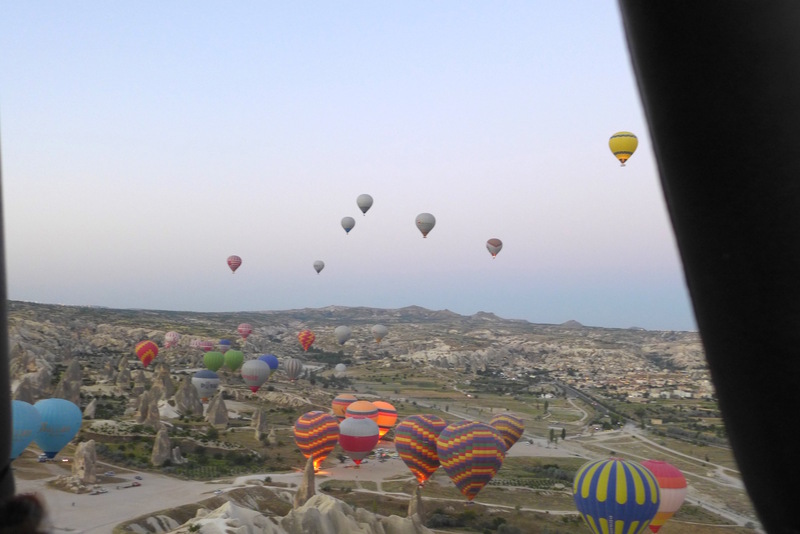 It’s at sunrise, and a whole lot of other balloons go up, meaning they become a cool part of your view too. 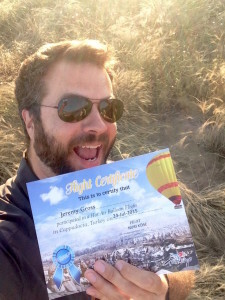 I knew people that had done it in the area, so this seemed like one of those times to splurge and break the daily budget and go for it. 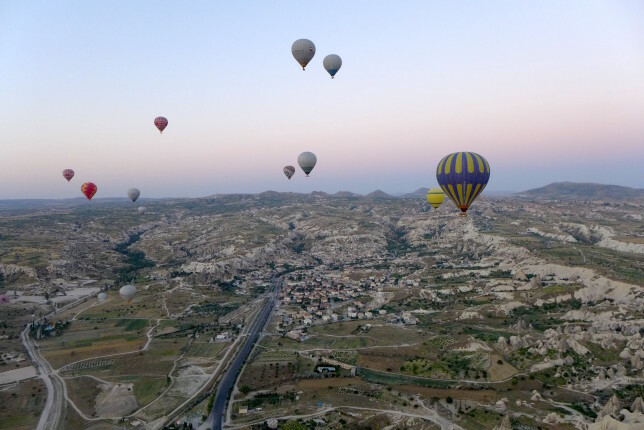 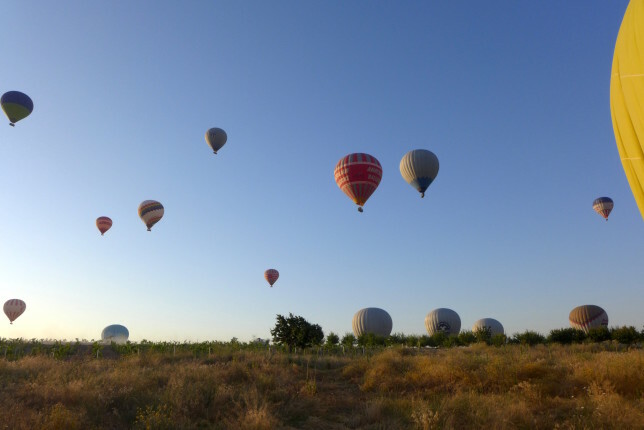 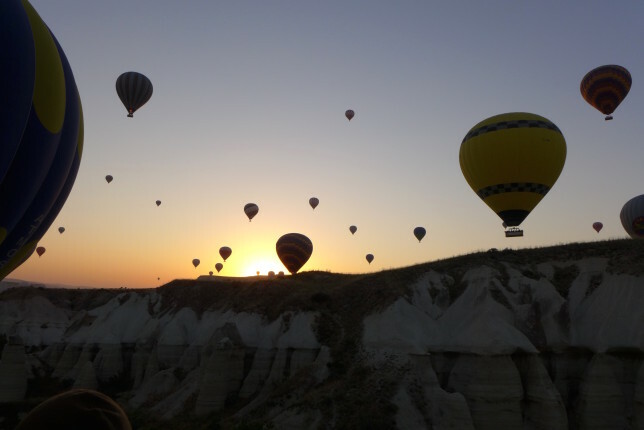 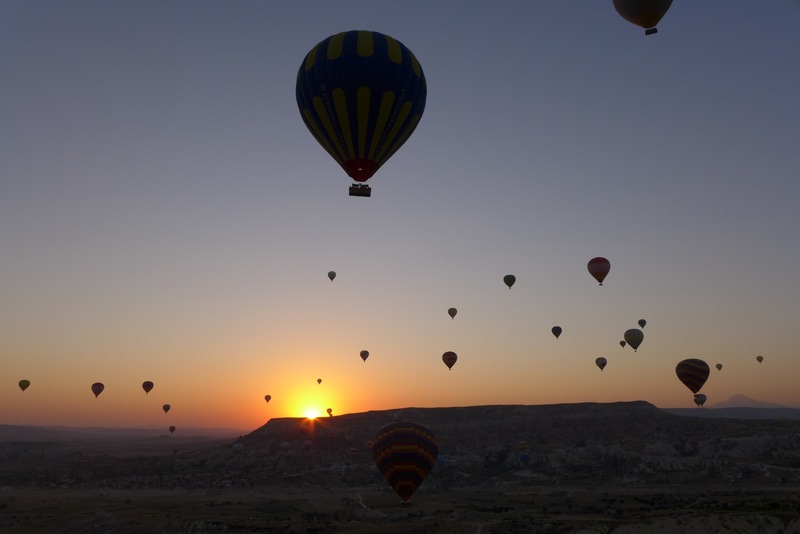 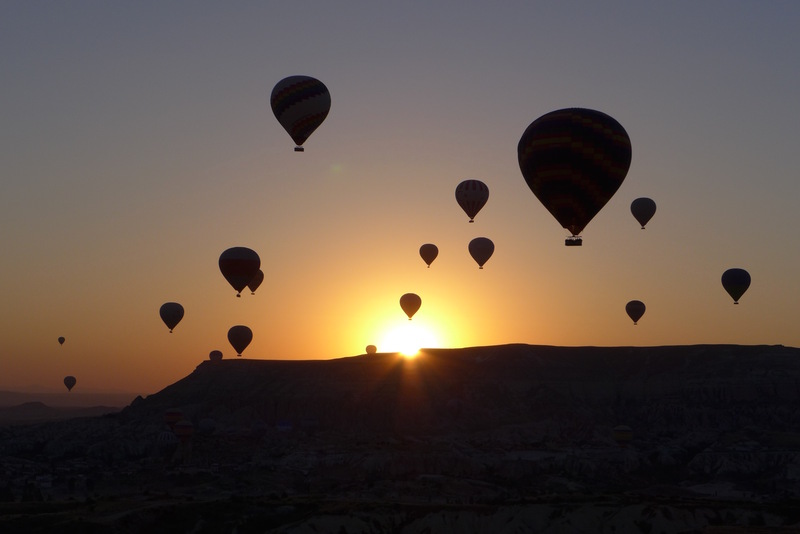 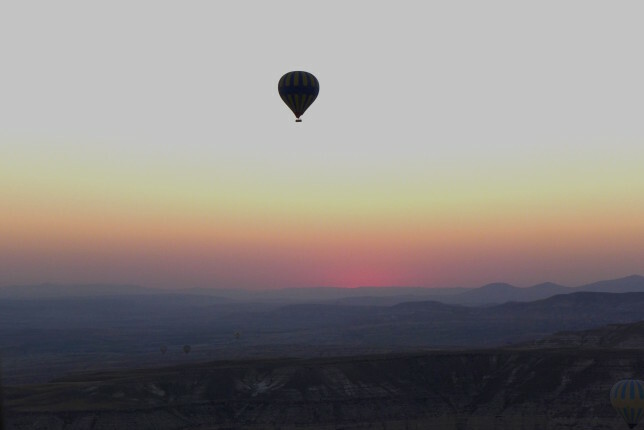 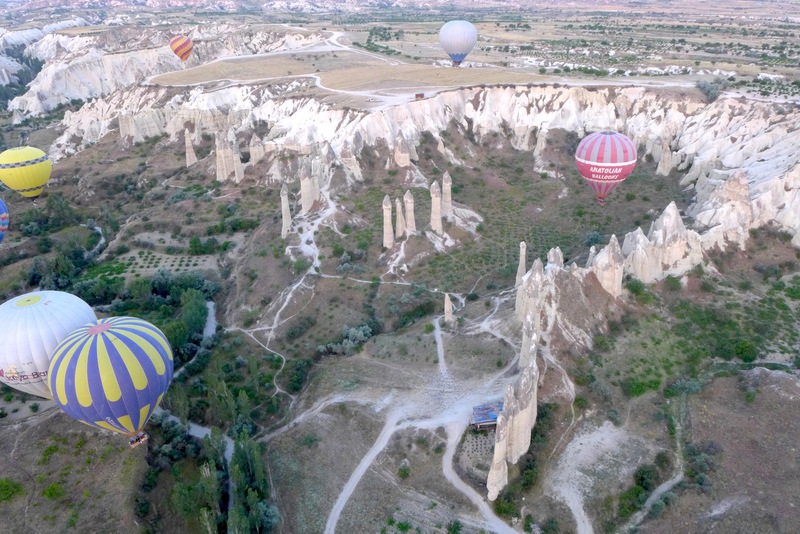 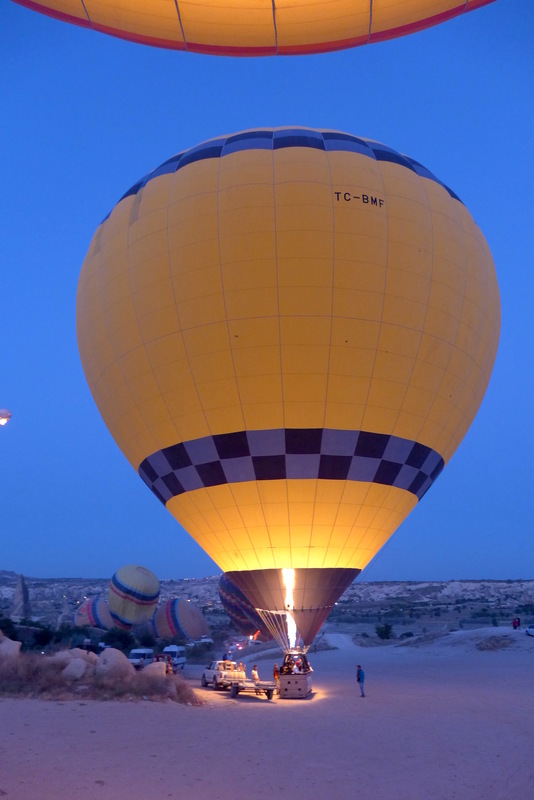 I definitely recommend doing this in Cappadocia. 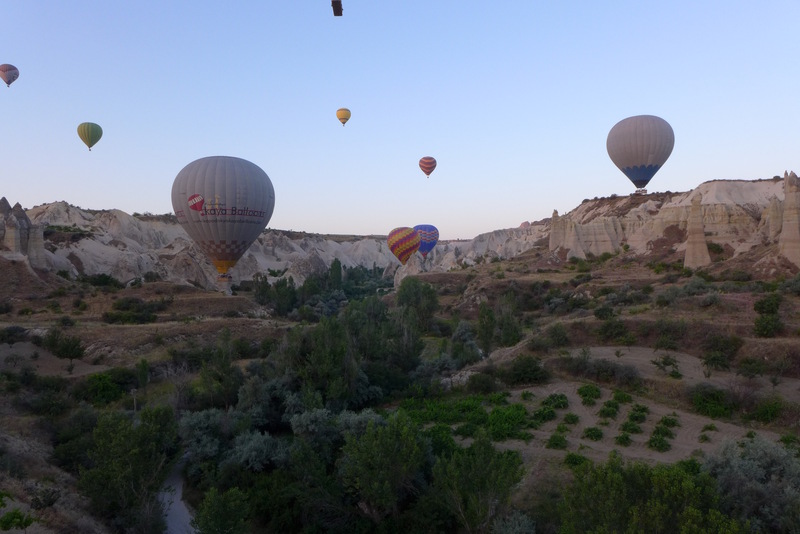 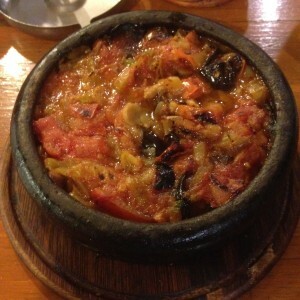 Here are some photos, I think they largely speak for themselves, it’s only a fraction of what I took. 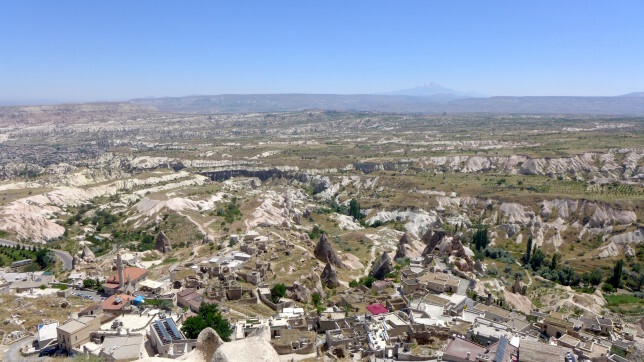 So many great views! When you get a certificate you don’t want to keep… take a photo with it! Avanos has a market on Fridays, so that’s an especially good day to visit, like I day. 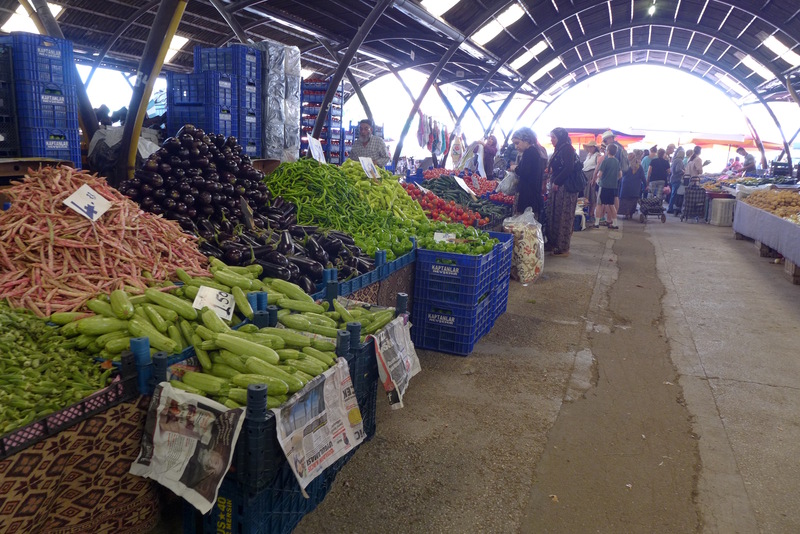 Lots of fresh produce and all sorts of other things. 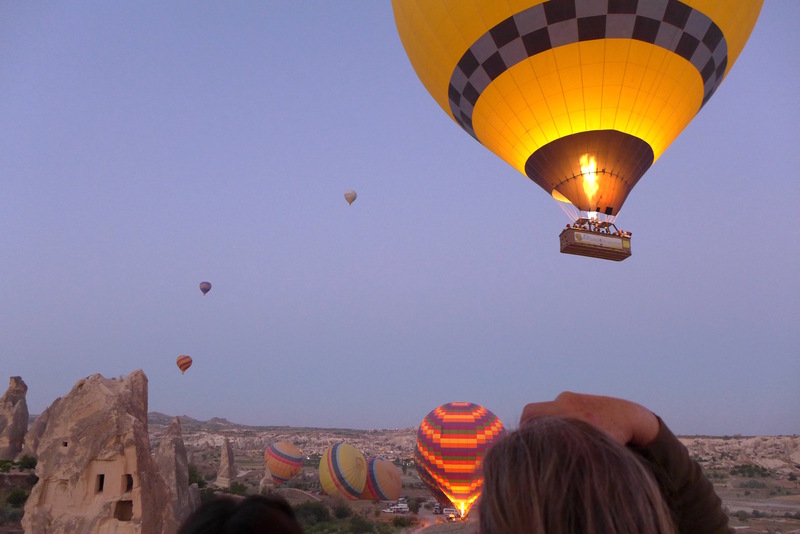 Overall I had a fantastic time in Cappadocia and definitely recommend it while traveling in Turkey. I could have easily spent more time there, doing more exploring and especially hiking.